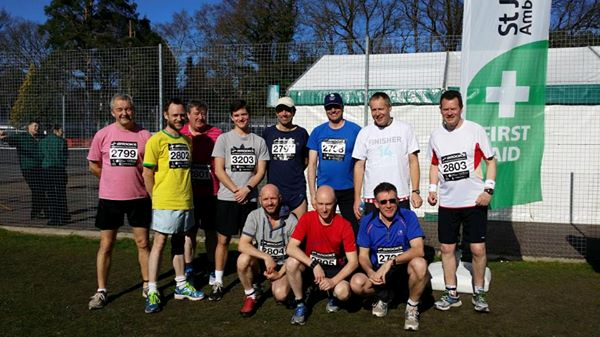 On Sunday March 16th under bright blue skies and an increasingly hot sun, twelve intrepid London Saints cricketers took part and COMPLETED the Fleet Half Marathon to raise funds for the West Indian causes that we will be visiting when we tour Trinidad and Tobago this May. We were supposed to be 15 but 3 withdrawals through injury or illness reduced our numbers to 12 and of those 12 at least half of us went into the event with some ailment or other. The hot weather and surprisingly undulating nature of the course surprised many of us (we all seemed to notice the uphill parts but the downhill parts of the course seemed to pass us by!) The result was that injuries (or was it just old age) were exacerbated and new ones picked up. Special mention must be given to David Nanton, who after turning up with 5 minutes to spare before the start, damaged his ankle which, along with his bad knee, meant that he had to walk the last 8 miles in great pain. He thought about giving up many times but bravely carried on in true London Saints spirit to finish in just over 3 hours. The other honourable mention must go to Nicholas Head. Now there were some who doubted the wisdom of Nick taking part or whether he would in fact finish but again his intensive gym fitness regime paid off as he managed to complete the course in just under 3 ½ hours. The honour of being the last official finisher was denied to him when someone else turned up 10 minutes later but 2nd to last, and at least completing the course, was a feat just in itself. 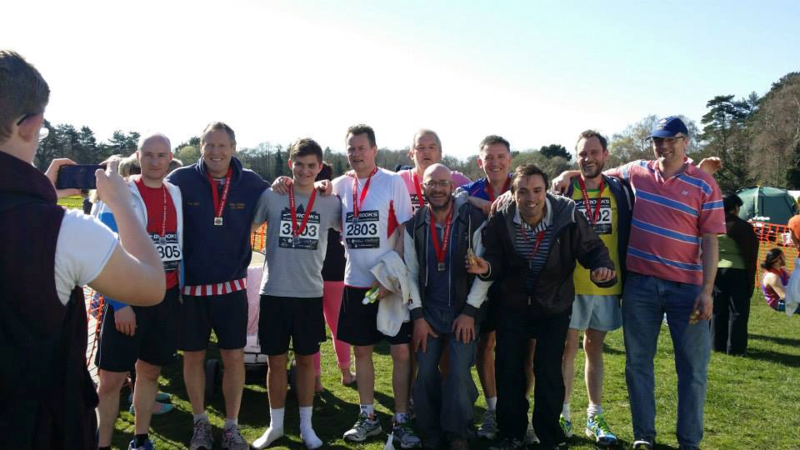 Very sadly all our injuries and ailments were put into perspective when we heard later that evening that the runner who collapsed on the course (which some of us saw) subsequently died of cardiac failure, not helped by the hot weather. He was only 48 and our thoughts obviously go out to his family. Our merry band of twelve was led home by Mike McIntyre in 1.49.46, who now takes the crown of London Saints Half Marathon champion to go along with his pool and darts championships. Mike was closely followed home by Pete (The Rat) Rattue in 1.50.40 with Dave Thomas also breaking 2 hours. The rest of our heroes finishing in just over two hours were in order; Andy Mayhew, Gavin Van Marle, Alex Henson, Peter Berkeley, Garry Burrell, Neil Hotston, Trevor Mayhew along with David and Nick. All deserve special mentions for dragging their bodies through months of cold and wet preparation training only to be confronted with dry and hot conditions. But we all completed and hopefully have raised many thousands of pounds for our causes in Trinidad and Tobago. So far we have raised over £5,000 with the target of £ 8,000. The fundraising appeal continues as more events are planned so if you haven’t already donated, you still can do so via the London Saints website or by cash to any of the runners or committee members. After: everyone (bar Dave Nanton and Nick head, who were still on the course) looking a combination of relieved, knackered and proud.